The Angora Fire approaches a local business structure. 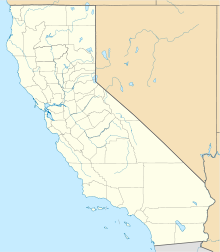 The Angora Fire was a 2007 wind-driven wildfire in El Dorado County, California. It started near North Upper Truckee Road subdivision near Angora Lakes, Fallen Leaf Lake, Echo Lake and South Lake Tahoe, California around 2:15 PM on Sunday, June 24, 2007 as a result of an illegal campfire. As of July 2, 2007, the fire was 100% contained, and 100% control (all interior fires extinguished) was achieved on July 10. The fire burned 3,100 acres (12.5 km2), destroyed 242 residences and 67 commercial structures, and damaged 35 other homes. At the peak of the fire, there were as many as 2,180 firefighters involved in battling the blaze. As of July 2, 2007, there were still 260 personnel fighting the remaining fires in the interior of the containment line. The fire cost $11.7 million to fight, and caused at least $141 million in property damage. The fire began at approximately 2:15 PM on June 24, 2007 near Seneca Pond, a small lake near Lake Tahoe and the town of Meyers. During that time, the region was experiencing extremely strong winds and low relative humidity, which fanned the fire and created an extremely rapid moving crown fire. Many neighborhoods were evacuated immediately, giving only very short warning to residents, sometimes as short as 5 minutes. In addition to the strong winds, the fire was also fuelled by unusually dry conditions in the Sierra Nevada (U.S.). A study concluded that snow pack was 29% of average in 2007. After an hour of burning, soot began to fall from the sky around the Tahoe Keys area. People flocked to head towards the source, but the firefighters blockaded the road near the high school. A day after the fire started, the state of California declared it a state of emergency, opening up state funds. Full containment of the fire was announced on July 2, 2007, two days before the 4th of July holiday. An investigation into the cause of the fire determined its point of origin. The fire was believed to be human caused, as no thunderstorms were occurring or in the vicinity when the fire began. On June 29, fire department personnel announced that the cause was an illegal campfire (or possibly a discarded cigarette into a campfire pit), and further investigation is pending. On July 3, the California Highway Patrol announced investigations into whether 911 dispatchers failed to notify authorities about numerous calls that began coming into them about the Angora Fire. A number of calls that were received about the fire were disregarded by dispatchers who claimed that the fire was a controlled burn. 911 calls from cell phones are received by the CHP. Residents in the area as well as golfers on a nearby course made calls that were later found to have not been reported. Investigations were pending as of Friday July 13. As of June 28, over $141 million in damage had occurred. 254 homes destroyed, 26 homes damaged and 3,000 evacuations were prompted, making it among the top half-dozen most costly fires in the U.S. As of June 28, the cost to fight the fire has been estimated at $10 million, with $5.5 million spent so far. FEMA will pay 75%. Losses to the tourist-driven economy are estimated/forecast to be around $1 billion. View of Angora Fire area from Flagpole Peak. Flagpole Peak is a mountain next to Echo Lake. Because the fire occurred in the watershed of Lake Tahoe, one of the primary concerns once the fire was out was the potential impact of the ash and debris on the Lake Tahoe hydrological system. Of major concern was the potentially hazardous debris from the 256 structures that were burned in the fire. To address this, the Governor issued Executive Order S-09-07 which initiated a major debris removal project to remove the structural debris as quickly and safely as possible from the 250+ private properties affected by the fire. The debris removal was operationally conducted by the California Integrated Waste Management Board on behalf of El Dorado County. Debris removal activities commenced on July 12, 2007 and was completed by the end of August. Work continues on erosion control measures and removal of potentially hazardous trees. No significant long-term ecological damage is believed to have occurred. ^ "South Lake Tahoe fire fully contained". SFGate. Retrieved 21 June 2015. ^ "Angora Fire General Information". ca.gov. Retrieved 21 June 2015. ^ "Search continues for missing British girl and boyfriend". Tahoe Daily Tribune. Retrieved 21 June 2015. ^ "Gov. Schwarzenegger Issues Statement on Survey of Sierra Nevada Snow Pack at 29% of Normal". Press Release. Office of the Governor. Retrieved 21 August 2007. ^ "CHP probes response to 911 fire calls. Local teens living in the neighborhood saw fire-suited government personnel leaving the area right before the fire. These teens blamed official fire personnel for the fire (e.g., controlled burn that went out of control) while investigators tried to blame the children. A jury trial on the issue resulted inconclusively". San Jose Mercury News. Retrieved 13 July 2007. Wikimedia Commons has media related to Angora Fire. This page was last edited on 12 September 2018, at 04:34 (UTC).